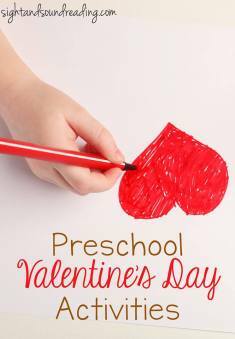 If you are looking for easy and fun Preschool Valentines Activities for home or classroom, we have a few great ideas that the children will enjoy! From worksheets to crafts and beyond, these Preschool Valentines Activities will bring a smile to their faces. Before we begin, though, I first want to introduce you to a few of our favorite Valentines Day books! Are you ready for some fun Preschool Valentine’s Activities? Here are some great ways to make learning fun! Love these! Thanks for including my seed packet Valentines! Kids are so lucky! All of these activities are so creative and fun! I can’t wait to do a few with my kids! 🙂 Hope you enjoy!